Referee. Born in Brandon, Gurba started to referee minor hockey and Big 4 League games in 1947 in his hometown. He officiated 13 inter-provincial series for the CAHA and worked in the Western Pro League until 1958. In 1961, he refereed an exhibition game in Brandon, between the Toronto Maple Leafs and the Detroit Red Wings. Andy was a referee in the Western Canada League and WHL (1966 -72). 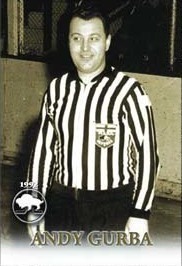 Andy Gurba also worked for the MAHA and MJHL from 1950-72 and held referee schools for 12 years.